Last week the Council on Foreign Relations informed me that they have awarded me the Hitachi fellowship for Tokyo Green Space. I am humbled and excited that these prominent institutions are supporting urban ecology and design anthropology. 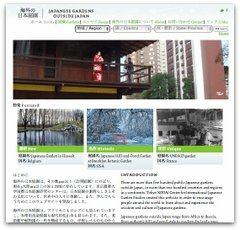 This link page will be occasionally updated with annotated links about green space initiatives in Tokyo, the United States and other developed and developing cities. The current organization is Tokyo, San Francisco, Other United States & Canada, Asia, Europe, Latin America, Africa, and a book list. This page is far from complete, and I welcome any suggestions for more links and categories. Livable City: San Francisco street advocacy group. Its executive director, Tom Radulovich, assisted with this link page. Alexander, Christopher. The Nature of Order: An Essay on the Art of Building and the Nature of the Universe. London: Taylor and Francis, 2004. Association of Environmental Business Women (ed). Kankyo Business Women [Business Women Working on the Environment] Tokyo: Nikkei BP, 2005. Cervero, Robert. The Transit Metropolis: A Global Inquiry. Washington, DC: Island Press, 1998. Dower, John. Embracing Defeat: Japan in the Wake of World War II. New York: WW Norton & Co, 1999. Enbutsu Sumiko. Discovering Shitamachi: A Walking Guide to the Other Tokyo. Tokyo: Shitamachi Times, 1984. Enbutsu Sumiko. A Flower Lover’s Guide to Tokyo: 40 Walks for All Seasons. Kodansha, 2007. Harrison, Robert Pogue. Gardens: An Essay on the Human Condition. Chicago and London: The University of Chicago Press, 2008. Isoda, Koichi. Shiso toshite no Tokyo [Thinking Tokyo] Tokyo: Kodan-sha, 1990. Jacobs, Jane. The Death and Life of Great American Cities. New York: Modern Library Series, 1961. Jinnai, Hidenobu. Tokyo: A Spatial Anthropology. Berkeley: University of California Press, 1995. Kumagai, Yoichi and Yoriyuki Yamada. “Green Space Relations with Residential Values in Downtown Tokyo: Implications for Urban Biodiversity Conservation.” Local Environment, Routledge Press, Vol. 13, No. 2, 141–157, March 2008. Miyazaki Hayao. Totoro no sumu ie [The House Where Totoro Lives] Tokyo: Asahi Shinbun-sha, 1991. Richie, Donald. The Japan Journals: 1947-2004. Berkeley: Stone Bridge Press, 2005. Seidensticker, Edward. Kafu the Scribbler. Palo Alto: Stanford University Press, 1965. Weisman, Alan. The World without Us. New York: St Martin Press, 2007. Winn, Marie. Central Park in the Dark: More Mysteries of Urban Wildlife. New York: Farrar, Straus and Giroux, 2008. Yomota Inuhiko. Tsukishima monogatari [Stories about Tsukishima] Tokyo: Kosaku-sha, 2007.